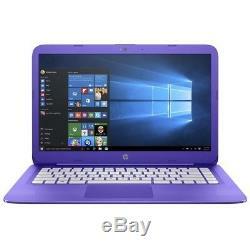 The 14 Stream Notebook from HP is a portable and lightweight notebook designed for users on the go. 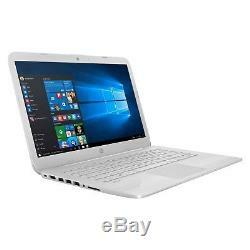 It's powered by a 1.6 GHz Intel Celeron N3060 Dual-Core processor and 4GB of 1600 MHz DDR3L RAM that enables it to efficiently multitask and quickly access frequently used files and programs. Its 14 SVA display, driven by integrated Intel HD graphics, has a 1366 x 768 resolution for crisp and clear HD content reproduction. Using the HDMI port, connect an external monitor for further functionality. For storage, this system is equipped with 32GB of eMMC flash storage. While it's not a lot, you can connect additional storage solutions via its multiple USB ports as well as its media card reader, which also can be used to quickly transfer files from mobile devices. Intel Celeron N3060 (1.6 GHz, up to 2.48 GHz, 2 MB cache, 2 cores). 4GB DDR3L-1600 SDRAM (1 x 4 GB). 14 diagonal HD SVA BrightView WLED-backlit (1366 x 768). Intel 802.11ac (2x2) and Bluetooth 4.0 combo. 1 x multi-format SD media card reader. Front-facing VGA webcam with integrated digital microphone. DTS Studio Sound with 2 speakers. Tablet Screen Size : 14 Inches. 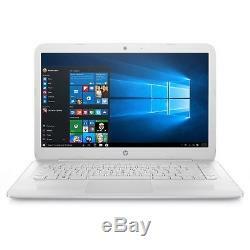 The item "NEW HP Stream 14 Laptop Celeron N3060 4GB RAM 32GB SSD Windows 10" is in sale since Tuesday, June 5, 2018. 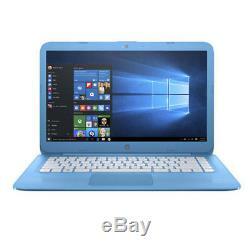 This item is in the category "Computers/Tablets & Networking\Laptops & Netbooks\PC Laptops & Netbooks". The seller is "232tech" and is located in Brooklyn, New York. This item can be shipped to United States, Canada, United Kingdom, Denmark, Romania, Slovakia, Bulgaria, Czech republic, Finland, Hungary, Latvia, Lithuania, Malta, Estonia, Australia, Greece, Portugal, Cyprus, Slovenia, Japan, China, Sweden, South Korea, Indonesia, Taiwan, South africa, Thailand, Belgium, France, Hong Kong, Ireland, Netherlands, Poland, Spain, Germany, Austria, Israel, Mexico, New Zealand, Philippines, Singapore, Switzerland, Norway, Ukraine, United arab emirates, Qatar, Kuwait, Bahrain, Croatia, Malaysia, Brazil, Colombia, Costa rica, Antigua and barbuda, Aruba, Belize, Dominica, Grenada, Saint kitts and nevis, Saint lucia, Montserrat, Turks and caicos islands, Barbados, Bangladesh, Bermuda, Brunei darussalam, Bolivia, Ecuador, Egypt, French guiana, Guernsey, Gibraltar, Guadeloupe, Iceland, Jersey, Jordan, Cambodia, Cayman islands, Liechtenstein, Sri lanka, Luxembourg, Monaco, Macao, Martinique, Maldives, Nicaragua, Oman, Peru, Pakistan, Paraguay, Reunion.